LoraSaysSo! 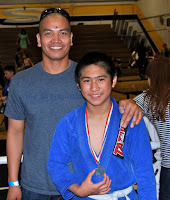 : Living with Autism - How Jiu Jitsu has changed my nephew's life! 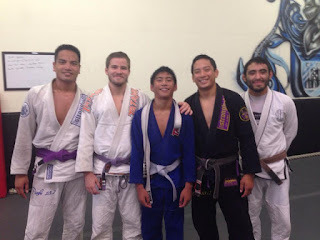 Living with Autism - How Jiu Jitsu has changed my nephew's life! Meet my nephew, Julian Bumatay, age 16. He has been in Jiu Jitsu for years. 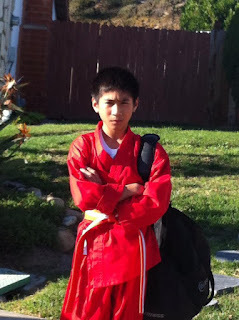 He trains and studies hard for his promotions and competitions. We are all so proud of his hard work and efforts I wanted to highlight him on my blog! Julian has been grappling since he was ten years old. I want to say it stemmed from an obsession with Bruce Lee that started when he was really young. One Christmas, we gave him Bruce Lee's book, Chinese Gung Fu. He was so happy! 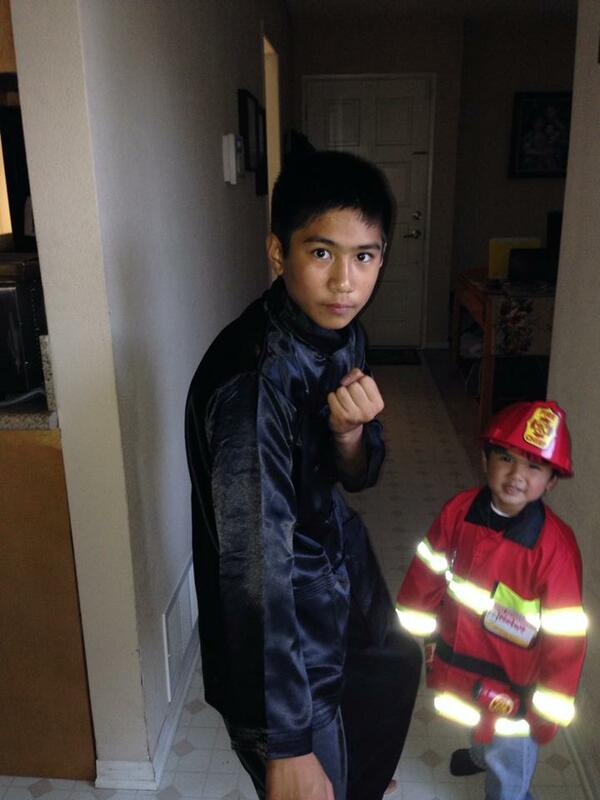 Here he is dressed as you know who for Halloween in 6th grade with his firefighting little brother, Nolan. 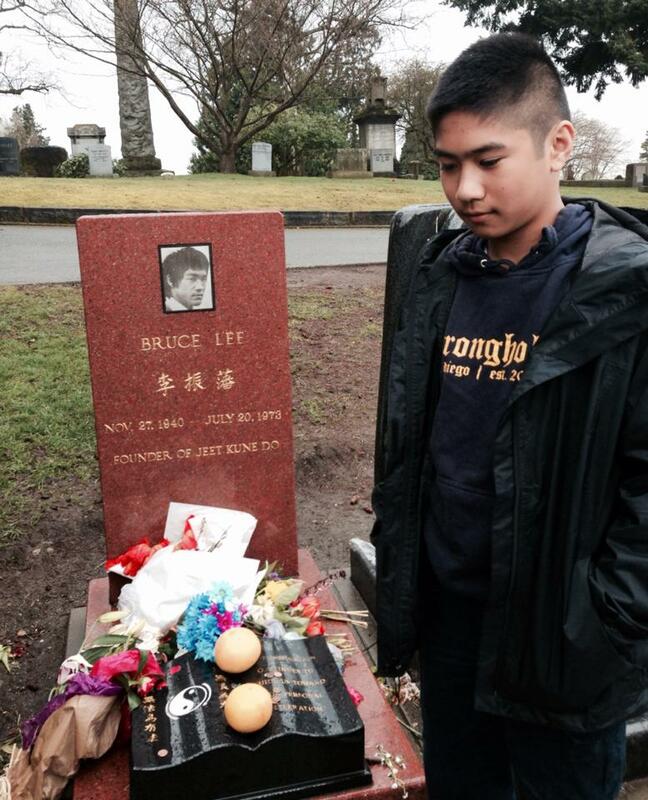 When Julian traveled to Seattle a couple of years ago for vacation, his parents knew that Bruce Lee's grave was a definite must-see for him. 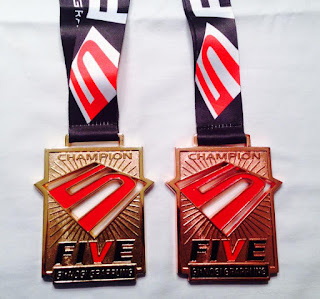 Why is Julian's First Place win so special to our family? I'll tell you why. 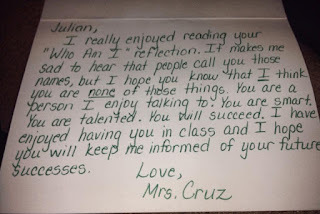 After years of struggling with communication skills, school work, his feelings of being incompetent, unaccepted and isolated, Julian was diagnosed with Autism in 2010. This explained a lot of his behaviors and his feeling of being different. He couldn't conform to group type sports and lacked self-confidence to feel comfortable around other kids. He felt like he never fit in. 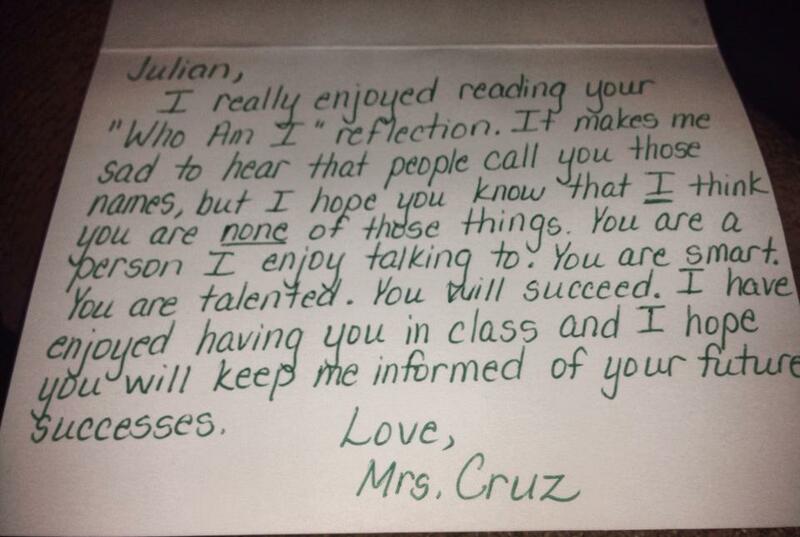 One of his elementary school teachers wrote this card to him. It made me tear up. Here's Julian, anxious and nervous to start 7th grade last year at EastLake Middle School. 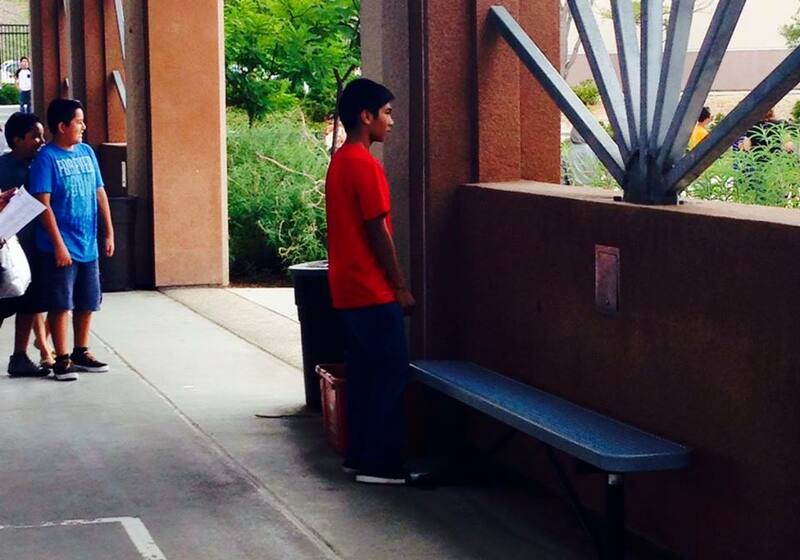 For many reasons, Julian ended up transferring to another school for 8th grade this year. As soon as he was diagnosed, Julian started to receive services from the San Diego Regional Center and his parents enrolled him in Brazilian Jiu Jitsu at the Stronghold Eastlake studio in Chula Vista, CA. In addition to the support of his parents and coaches, combined with Julian's own sheer resilience...jiu jitsu has changed his life. 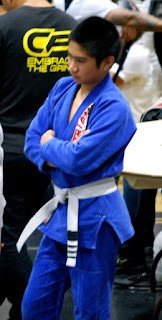 This was taken in 2012 at one of his first tournaments. Julian was ready for his opponents! He ended up taking second and third place in that tournament. 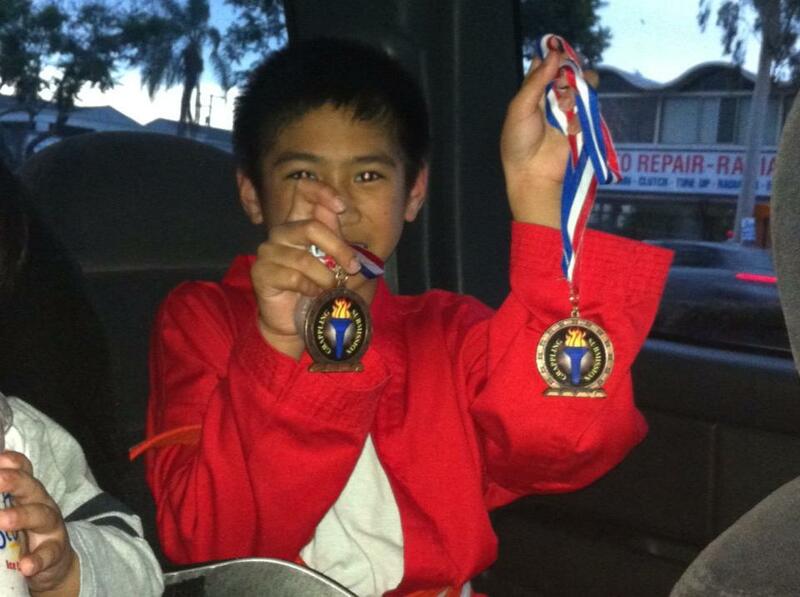 In 2013, Julian won 1st and 3rd in a Gi and No-Gi competition in Long Beach, CA. 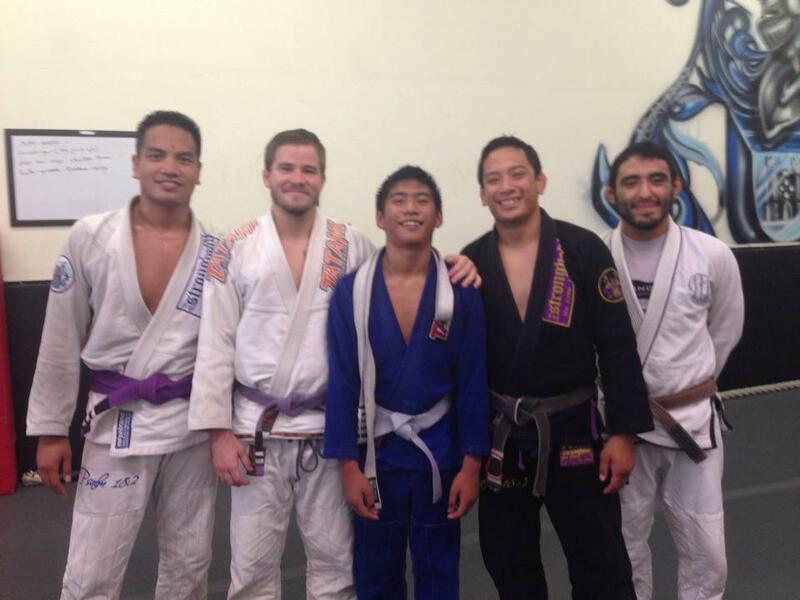 In March 2014 we were able to watch him as he participated in his studio's promotion process to earn a stripe. 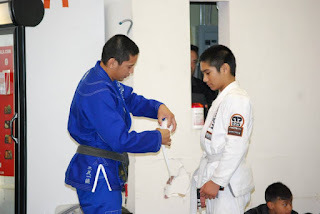 I was shocked at the physical endurance that the students had to exert in order to earn a stripe on their belts. 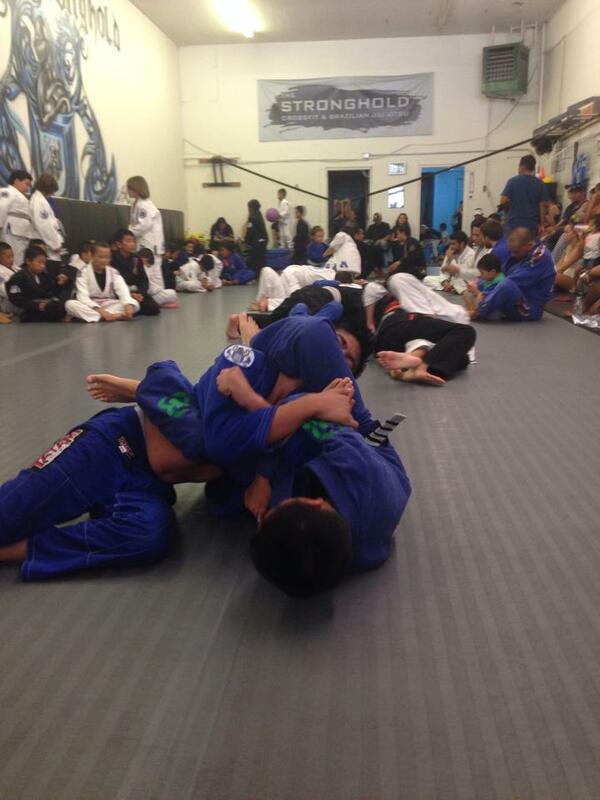 Julian must have grappled at least ten different kids non-stop for over a half hour. He deservedly received this stripe! Coach Mike Cusi giving Julian his stripe. In September 2014, he earned another stripe. Here's Julian feeling accomplished with some of his coaches. Last year he also competed in the same BJJ Dream Tournament he won this year. Julian was seriously sizing up the competition. He ended up taking second place in his division! Coach Vince was there to support him! Julian prepared for a 2015 tournament physically and mentally. Check out his flowchart! Obviously his strategies worked! 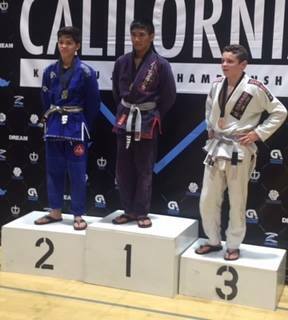 Here are the videos of Julian's three matches that made him the First Place winner of his division in the 2015 BJJ Dream Tournament! Grappling is only a part of Julian's life. He also loves to game on his Playstation, watch anime, film himself on Dubsmash, and eat! 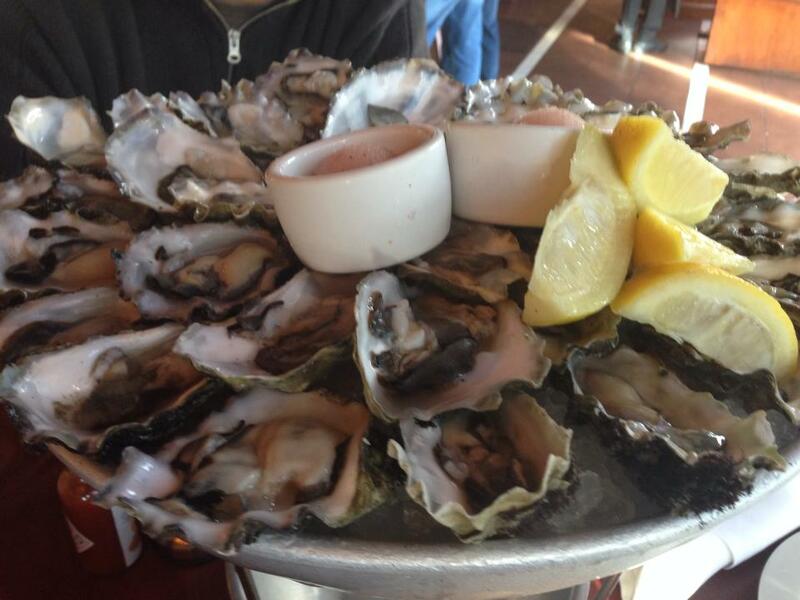 Especially oysters, any seafood really! This kid can put it away like a true Bumatay! 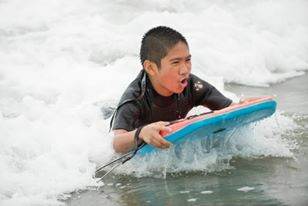 Julian also likes to be outdoors, fishing and surfing! This tough competitor has a soft side too. Julian's concern for his friends and family is admirable. He is a very loyal, considerate and genuine person. He worries about the health of his mom and his grandparents and he is also quick to correct his own behavior when he knows he said or did something wrong. 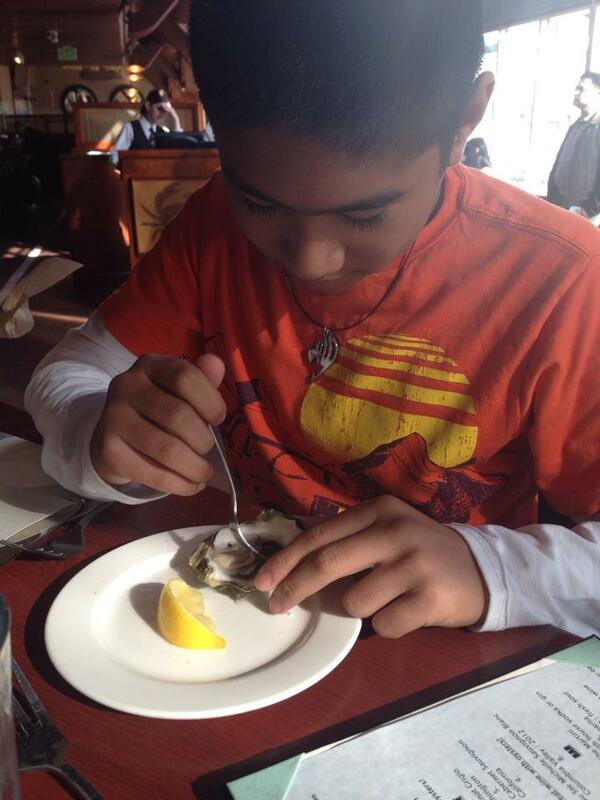 Julian is also good with his little brother, who I am sure wants to be just like him when he grows up! 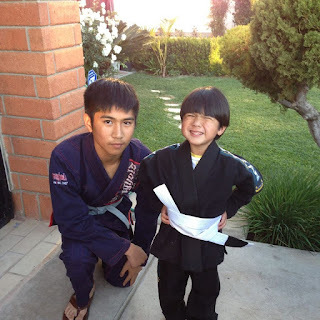 Through Jiu Jitsu, Julian has experienced the result of what hard work can do for you, what success feels like and has gained the confidence to be himself. We can't wait for what the future holds for our CHAMPION! CONGRATULATIONS to you, Julian! Congratulations on your nephew's success. He has worked hard to earn his accolades. Very heartwarming. Thanks CC! He really tries his best! What a great story Lora! Julian sounds like a great young man! His success also comes from supportive, attentive, and encouraging family and friends like you! Hey! Congratulations on your nephew's success. He is a real winner from my view. 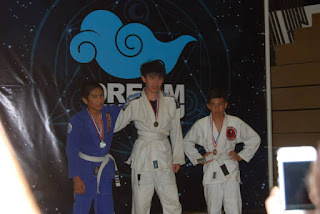 He not only won a competition but also defeat his Autism. I learned Kids Brazilian Jiu-jitsu in Connecticut when I was a child but never won like him. Thanks John! He works hard at it!